Modernization has taken many of the districts in Tokyo by full force but suburbs like Azabu Juban still retains the old neighborhood charm with shops of more than 100 years in history. Shiroikuro does not belong to that category being opened only in 2012, but neither is it the hipsterish cafe we know of. Embracing the concept of black and white, Shiroikuro is a minimalistic cafe that sells everything to do with Kuromame (黒豆). It was renovated from an old shop house and opened in late 2012, fusing the elements of traditional Wagashi (和菓子) confectionary house and cafe as one. BAKE Cheese Tart Opens @ ION Orchard : They were Born in Singapore? You must have heard about it by now. 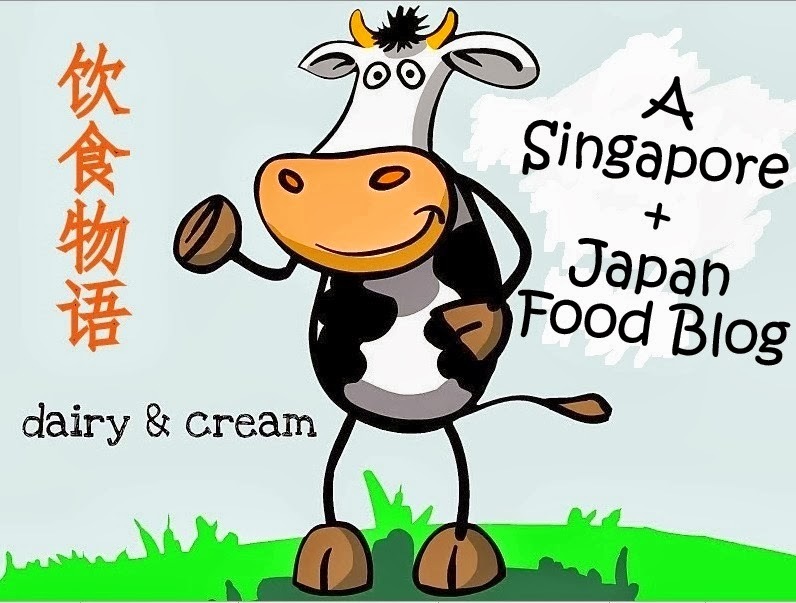 BAKE, the legendary cheese tart shop from Japan will open its flagship store @ ION Orchard tomorrow, 29th April. Looks like there is going to be a fierce cheese tart war in Singapore as local competitors like Antoinette, Prima Deli and BreadTalk have already entered the hot cheese scene with their own versions of cheese tarts! But I guess nothing can be compared to BAKE, the godfather of this cheese tart, which constantly attract a long stream of customers to queue at any of its domestic or overseas outlets. Made with three types of cream cheese (2 from Hokkaido and 1 from France), the cheese mousse filling sits in a twice-baked dark golden brown cookie shell. Being committed to ensure consistent quality and perfect standards, the tarts are produced in the Sapporo central kitchen and flown in every two weeks. So now you know why they are more expensive than the ¥200(~$2.40) ones from their outlets in Japan. That said, do you know that these crazily popular tarts are actually born in Singapore? The last time I ate a curry chicken Mee was probably an instant noodle version. It isn't a dish that I would usually order at hawker centers. In the first place, there is very few stalls which sell this dish. Hence, it caught my attention to see two stalls selling curry chicken Bee Hoon Mee at Hong Lim Food Centre. And they are located right above each other! I was deliberating which stall to try as both seemed to be highly recommended by the media, judging at the no. of posters and newspapers clippings displayed at both stalls. Heng Kee at 1F seemed like the more popular stall as its queue was longer (yet moving at a far slower rate) than that of Ah Heng on 2F. What to do? Try both lor! Sometimes I feel that I am eating the world via Tokyo. In this 24/7 city which loves to eat, the number of international brands from the East or West are increasing exponentially, leaving the Tokyo-ites to be spoilt for choices. 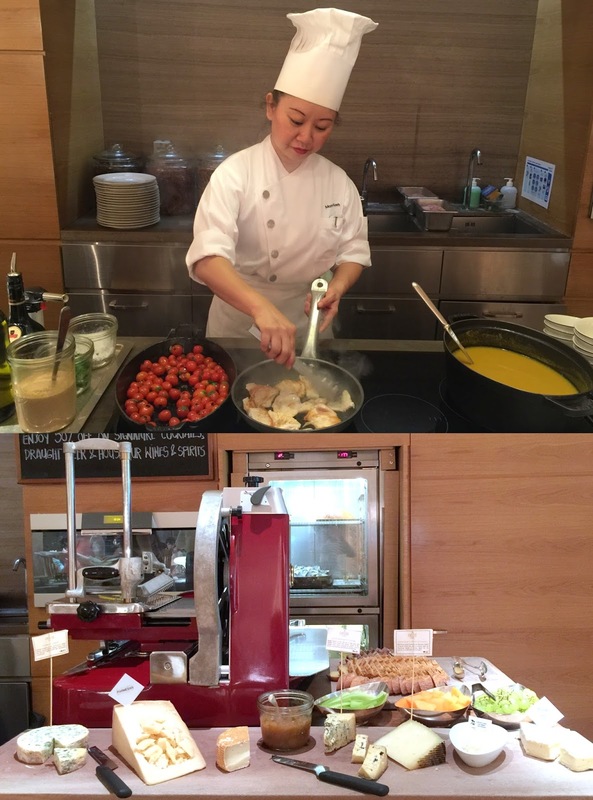 After Bills, Dominique Ansel, Clinton, Rituel and many others, London brunch institution Franze and Evans is one of the latest which has opened its doors in Omotesando Hills. There is a kind of feel-good moment as I stepped inside this warm cosy settings in rustic wooden decor and chic graphic paintings. It makes me want to linger on for a good, relaxing meal without the pressure to hurry. After much anticipation, I have finally got a taste of the works from Hugo & Victor, the luxury Parisian patisserie which has unveiled its first store at the basement floor of Isetan Shinjuku. Started in Paris since 2011, Hugo and Victor is helmed by award-winning pastry chefs Hugues Pouget and Sylvain Blanc (Go google their pictures, they looked as hot as their pastries hehe). The more well-known Chef Hugues was formerly from three Michelin-starred Guy Savoy and his exquisite jewel-shaped chocolates are often the most sought after items in store. One of the things in Japan that always amazed me is how the Japanese is able to maximize the limited space for business. Ichirin is a hole-in-a-wall uni specialty restaurant off the noisy, bustling Shinjuku that seats around 20 pax on the first floor. However, these seats are mainly counter table seats and thus groups of 4 or more will be led to the "private rooms" in the basement via a long deep staircase. Yakitori and Teppan Azmaya @ Lau Pa Sat : Mega Buta-Don and More! 250g of pork over the rice? Really? 250g? The crumpled piece of A4 size paper printed with the slogan 男のブタ丼 was hastily shuffled beneath a bowl of very delicious looking Grilled Pork Donburi. But before you start to salivate, you realize it is just part of the troop of plastic food items on display at the counter. It stands out from the other stalls for obvious reasons as you won't find a Fishball noodle stall displaying their "fake" Mee pok tar next to the cashier counter. Clever marketing tactic, I say. It attracts customers, mostly males (Japanese salarymen) who are keen on such hearty, meaty portions. And as the name might already suggests, this stall is the hawker outlet of the Shabu Shabu Azmaya Restaurant in Robertson Quay. 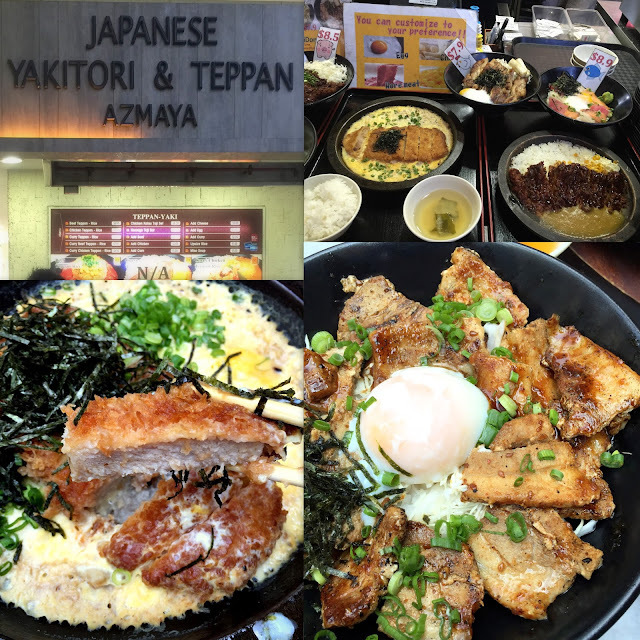 The menu offers mainly deep-fried katsu rice bowls and curry Teppanyaki rice at a very reasonable average price of $8. Customers can also customize their own bowls by opting for more egg, cheese, curry....or more meat (probably if you hadn't eaten meat for a month). Even though this is not a vegetarian-friendly place, seafood lovers will not be deprived of options such as Sashimi Don ($8.90) or the Tempura Kaisen Don ($7.90). Walk through the bustling Komachi-dori towards Hachimangu Shrine and one might be too distracted by the shops to notice that there is a beautiful patisserie hidden in one of the back alleys. Patisserie Yukinoshita is a chic and relaxing pastry boutique that offers a good range of petit gateaus and semi-decs. So what does one ton noodles sell? Wanton Mee la! Clever name pun aside, I was curious to try the bright red wanton Mee which I saw many people were ordering. This stall is owned by an old couple and there was a long queue despite the fact that the uncle was actually working through the orders very quickly. My tastebuds still don't understand why the cakes from M.Koide are rated the best in Tokyo (and most likely Japan). Not because they taste bad--in fact they are excellent--just that I can't perceive any eminent qualities in them. Patisserie M.Koide topped the Tabelog Sweets Ranking 2016, usurping the throne of Patisserie A Tes Souhaits. But the most amazing thing is that the shop, barely larger than a living room, is camouflaged perfectly in one of the quietest corner in Jiyugaoka. Even with the travellers' best friend GPS, you may still find yourself walking in rounds like a clueless housefly. There was no queue at all, but you could tell the popularity of the cakes as several items had been set aside (meaning somebody had reserved them). The price isn't very welcoming indeed, with the most affordable Foret Noire at ¥600 in a diminished size. Like Higemi Sugino and Occitanial, these cakes are predominantly mousse-based and the staff "strongly" advocates customers to takeaway ONLY if the trip takes less than 30min (of course, I had to lie that I was going to consume it immediately, like right outside the shop). While the Mousse au Chocolat Blanc (top pic) was expectedly very milky and sweet, the white chocolate flavor were not overtly glaring as it was counter checked by a tangy cassis mousse. You may dismiss it as just another typical mousse cake but wait till you give it a shot. There's a kind of unexplainable strength, an invisible force in the silky and light layers. This is what I have not encountered before. It seemed like the chef takes a very cautious, measured approach to his cakes as the Caramel Opera is a very prim and proper cake that weaved the sweet caramel mousse and bitter dark chocolate seamlessly together. The buttercream melts graciously on the tongue without any trace of grease. The level of sweetness versus bitterness--it all came together perfectly, or perhaps too perfect that it sent shivers down my spine. The caramel opera seemed too far-fetch for me, something which I can only lust in my dream chambers. My favourite was something closer to my heart, Noisette. It's a 6-layer hazelnut chocolate composition that summoned one's consciousness to the milky reality. There was a resolute-sounding snap as I forked my way through the smooth dark glaze right down to the moist earthy cushion. A cake of chocolate envy. Everything was just so right. And if I could point out one flaw, it's the feeling that the cakes are too serious. Grandma Ban Mee 老妈子板面 @ Amoy Street: Super Shiok Chilli Noodles! Next time if I were to open a stall, I will put my papa or mama or ah ma or ah gong's name into the signboard because I think it will help to pull in more business. Think Ah Gong Bak Kut Teh or Mama's Pasta. Yet another stall is named after Grandma, but it doesn't just leverage on Grandma's cooking powers because the noodles are truly terrific. Lao Ma Zi Ban Mee is a new stall that opened last Dec 2015 at Amoy street. With the red signboard and cartoonish white Chinese characters "老妈子”, I thought this was a stall selling spicy Sichuan cuisine until I took a closer look at this menu. It's simple and fuss-free with only 3 options (Chilli/ Dry/Soup) and additional toppings come at extra charge. Afternoon tea? buffet? Or both? I can't seemed to draw a line between afternoon tea and buffet as both are merged as one for the Afternoon Tea @ 10 Scotts, Grand Hyatt Singapore. Besides an exquisite two-tier of savoury selections, there is a long buffet table of cold cuts, sushi, desserts, cheeses, ice cream, freshly shucked oysters, freshly pressed juices and even a LIVE station featuring a plated savoury hot dish. During my visit, it was Flambeed Chicken Fillet in Red Wine. Simple as it seemed, the chicken breast meat was seared to the right tenderness and so delicious that you can see many returning for second or third servings. After trying most of the pastries and dinner dishes at DAB, I brought the Family to suss out more savoury dishes that are also available from the same all-day menu. Opened from 9am, the 2F cafe looks a lot brighter and cheerier during the day than my previous visit at night. As usual, one will not find typical brunch items such as Scrambled Eggs or Eggs Benedict since the chef-owner is renowned for his idiosyncratic twist. The Molten Egg Omelet Souffle スフレオムレツ(¥1250) resembles a thick, airy version of Chye Poh Neng but the innards are warm and creamy, served with some savoury brown sauce. When a chef names his sandwich as the "Perfect Little Egg Sandwich" (¥800), it had better live up to the name and this proved to be a success story.